So many kit cars are based on VW Beetles, that they form a category of their own, but the variety of kit cars available which use a Beetle chassis is staggering. Everything from the familiar dune buggy and beach buggy, through to the hot-rod styles of kits like the Wizard Roadster. Classic replicas like the Pilgrim Porsche 356 Speedster share their donor vehicle with the sporty Eagle SS and a vintage-styled Bentley Blower replica. In fact apart from the donor vehicle, all that these kits have in common is that you would be mad to try anyone other than Adrian Flux, the UK's number one kit car insurance specialist, when it comes to getting VW Beetle kit car insurance. 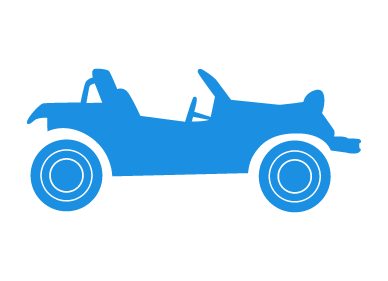 Not only do we have we have a wide range of specialist kit car insurance schemes, we also have a range of schemes designed specifically for VW Beetle cars and their derivatives. That means that true enthusiasts can benefit as we source quotes from a number of leading VW and kit car insurance providers. We are able to offer cover for all situations, including young drivers, high-powered cars, and even offer track day cover on some policies. From a Baja Bug to a Wizard Roadster to a Porsche replica, - if you can stick it on a Beetle, we can cover it! With over 40 years experience in arranging insurance for every kit and self-build car imaginable, we will tailor a kitcar insurance policy as individual as your Beetle. Our many years in the field have enabled us to gain a vast knowledge of the kit car market, we know the needs of the kitcar owner and deliver tailor-made and well tested insurance policies providing cover from build to road. Due to the type of vehicles we insure, all our policies are designed especially for the out of the ordinary and our staff have a high degree of knowledge in this field. Our staff are all seasoned insurance experts and will calculate your premium individually, using their expert knowledge of the many insurance schemes on offer. Quicker & Cheaper rates by phone complete the call me form during office hours (9am to 7pm Monday to Friday & 9am to 4pm Saturday) for an immediate, no-obligation kit car insurance quote. ** Sample quotes are for comprehensive premiums for a male driver with a clean license and full No Claims Bonus (unless stated otherwise) and limited mileage of 3000 miles. Quotes for 5000 miles would add approximately 15% to the premium. These illustrative quotes, valid as at 05/04/2006, are provided for information only and do not form the basis of any contract or tender. Volkswagen Beetle Beach Buggy & Dune Buggy Variants. Wizard Roadster Insurance. Baja bug insurance.